"Official police business." 20th Century Fox has debuted the first official trailer for action comedy Stuber, which premiered at the SXSW Film Festival back in March. This is yet another new high profile Hollywood buddy comedy starring Dave Bautista, along with My Spy which also had a trailer last week. Dave Bautista stars as a detective who suddenly recruits his Uber driver into an unexpected night of adventure. Kumail Nanjiani also stars, with a cast including Iko Uwais, Natalie Morales, Betty Gilpin, Jimmy Tatro, Mira Sorvino, and Karen Gillan. This looks hilarious, and the buzz out of SXSW is just as positive. One review described the film as "a mixture of Lethal Weapon meets Rush Hour meets Mr. Magoo." Looks that crazy and absurd, for sure. And I totally love the use of the Beach Boys song in this trailer. Have a fun time. When a mild-mannered Uber driver named Stu (Kumail Nanjiani) picks up a passenger (Dave Bautista) who turns out to be a cop hot on the trail of a brutal killer, he's thrust into a harrowing ordeal where he desperately tries to hold onto his wits, his life and his five-star rating. 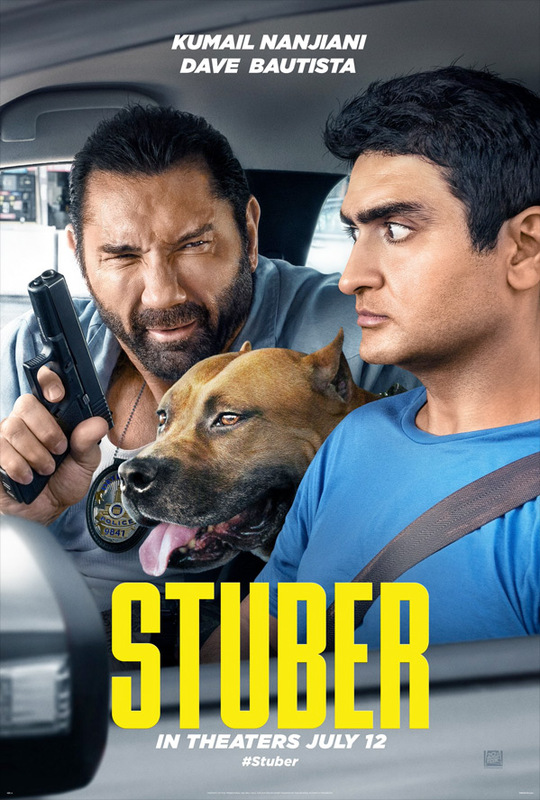 Stuber is directed by Canadian filmmaker Michael Dowse, director of the films Fubar, It's All Gone Pete Tong, Fubar: Balls to the Wall, Take Me Home Tonight, Goon, and What If previously, plus episodes of "Man Seeking Woman" and "Future Man". The screenplay is by Tripper Clancy (Four Against the Bank). Produced by John Francis Daley and Jonathan Goldstein. This premiered at the SXSW Film Festival last month. 20th Century Fox will release Dowse's Stuber in theaters everywhere starting July 12th, 2019 this summer. First impression? Who's in?